If the recipe doesn’t call for a spice rub then do this with a little kosher salt and fresh cracked black pepper or follow my instructions on how to make a spice rub. Sear a few minutes per side in a hot oiled pan or Dutch oven set over high heat. Contrary to the oft-repeated food myth that searing will lock in moisture it’s still an extra step worth the extra effort. 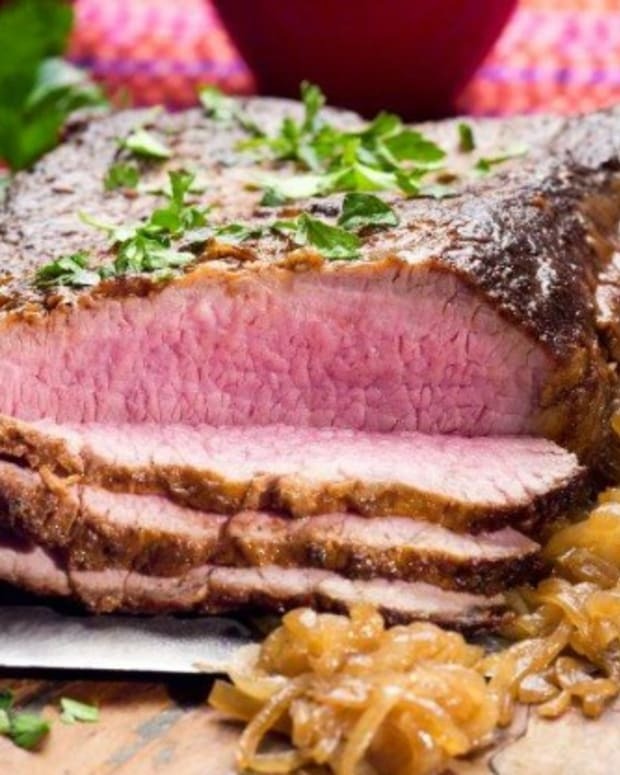 The caramelized surface of the meat will add an incredible depth of flavor to your brisket enhancing both the meat and braising liquid with layers of complex flavor. The contrast in taste and texture to meat with a seared crust and soft interior makes the food more pleasing to the palate. Brisket and meat dishes in general that have not been seared can taste flat and boring. 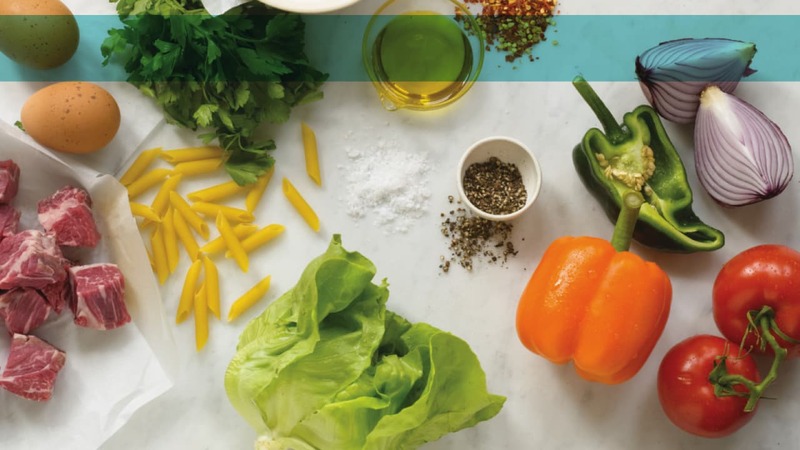 This hands-off method is a G-dsend for (busy) home cooks. 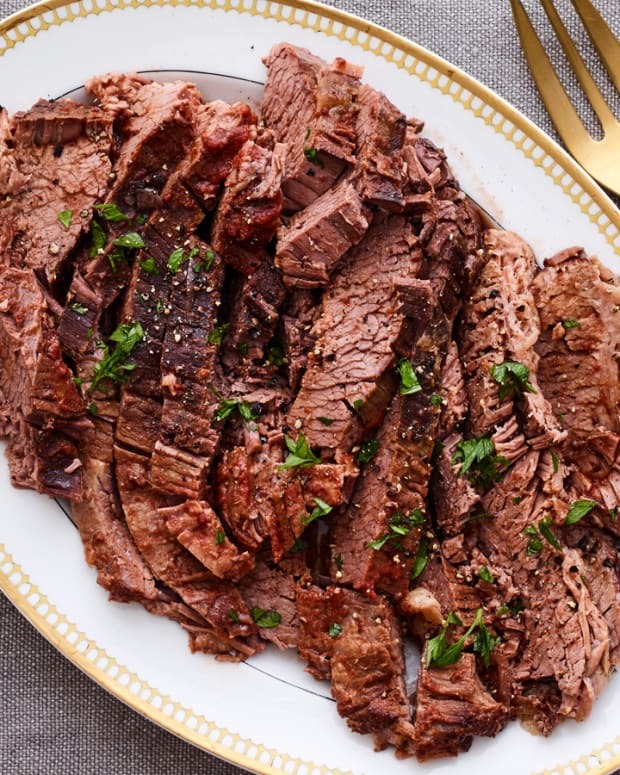 Heat + time + moisture breaks down the tough connective tissue making it an ideal way to cook tougher cuts like brisket. 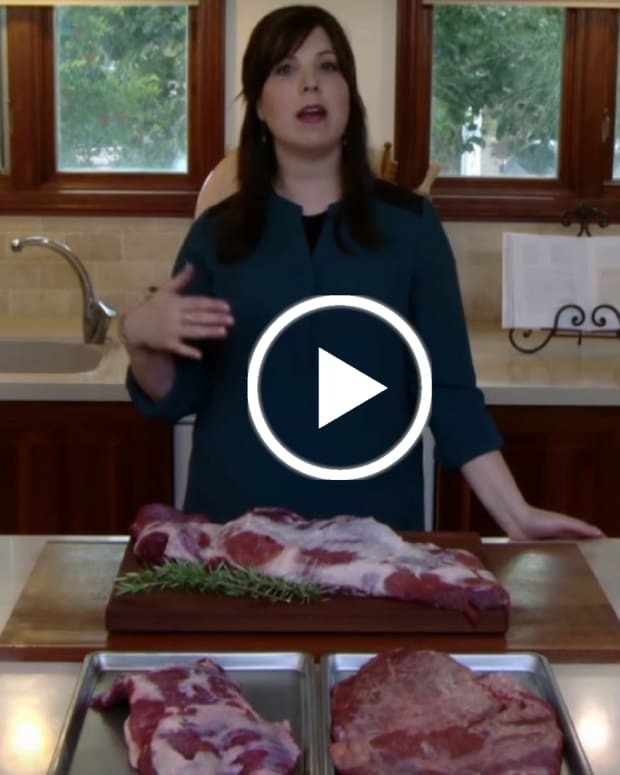 Ideally, between 250-350℉is where you want to braise your brisket, about 1 hour per pound. I like to braise my brisket at 325–350℉. 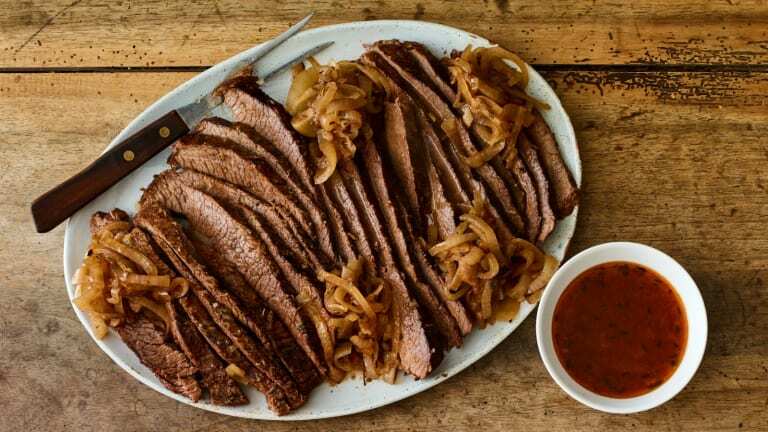 Best braised in a Dutch oven or tightly covered pan/roasting dish, liquid (usually something acidic – tomatoes, beer, wine, vinegar + water or stock) should not cover the meat entirely (that’s called boiling) but rather reach no further than 2/3rds of the way up the side of your brisket. 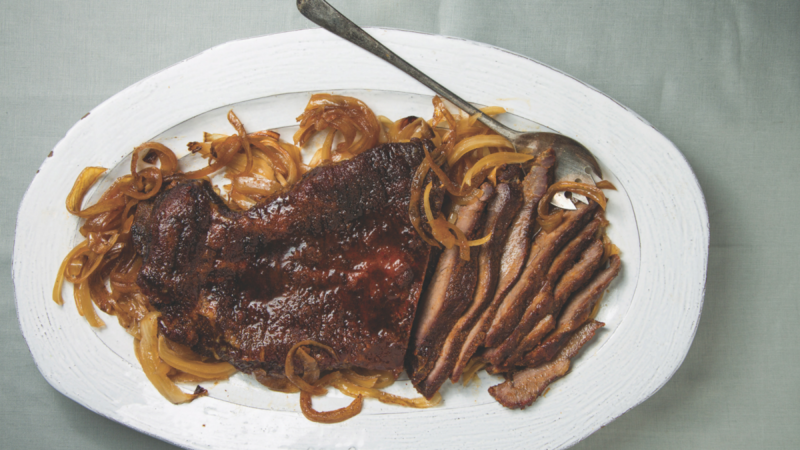 Tightly covered and cooked at a low temperature will yield fork-tender brisket. The braising liquid will become your sauce or gravy. Made the Night Before at the very least. You can even make it several days or weeks or even months in advance. 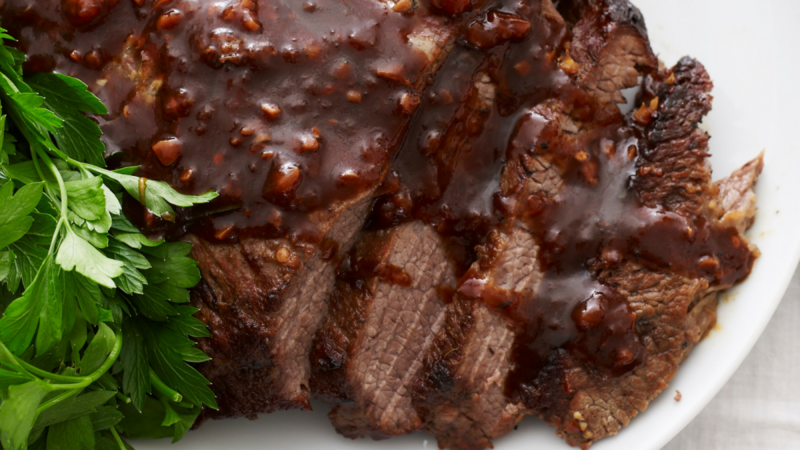 Refrigerating or freezing sliced brisket in sauce and rewarming it will only further soften the meat. Sliced Cold against the grain. Far better than letting your brisket sit for a minimum of 15 minutes is refrigerating it overnight and slicing it cold. 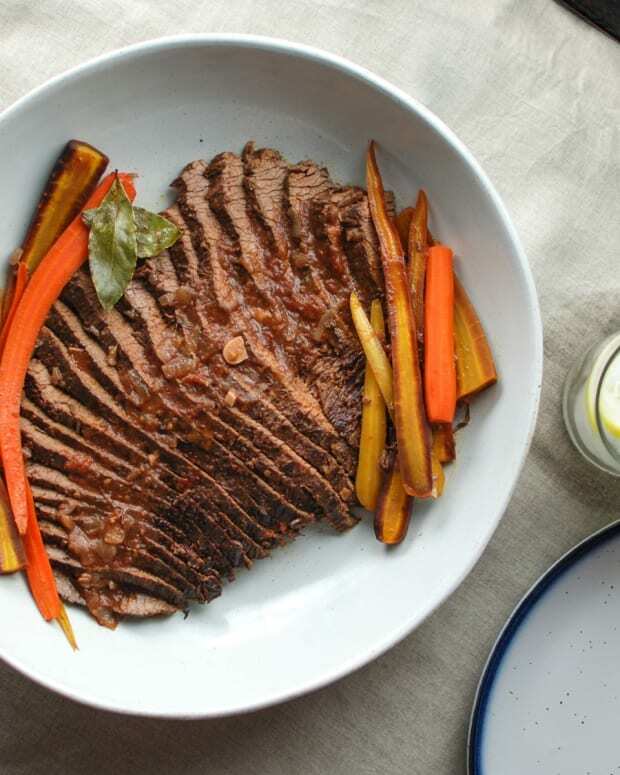 This will produce beautiful thin slices in a way that slicing the ever-so-slightly-rested, semi-warm, soft brisket never can – if not sliced cold brisket often shreds. 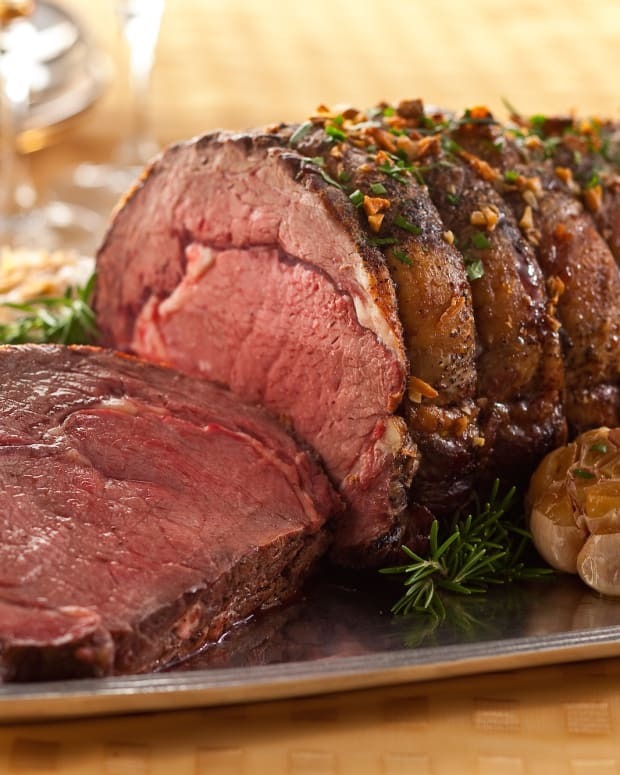 Further, its little sleepover in the fridge makes removing the fat (that has congealed at the top) super easy – resulting in a far richer, more pleasant, full bodied sauce or gravy. Watch how to slice against the grain. 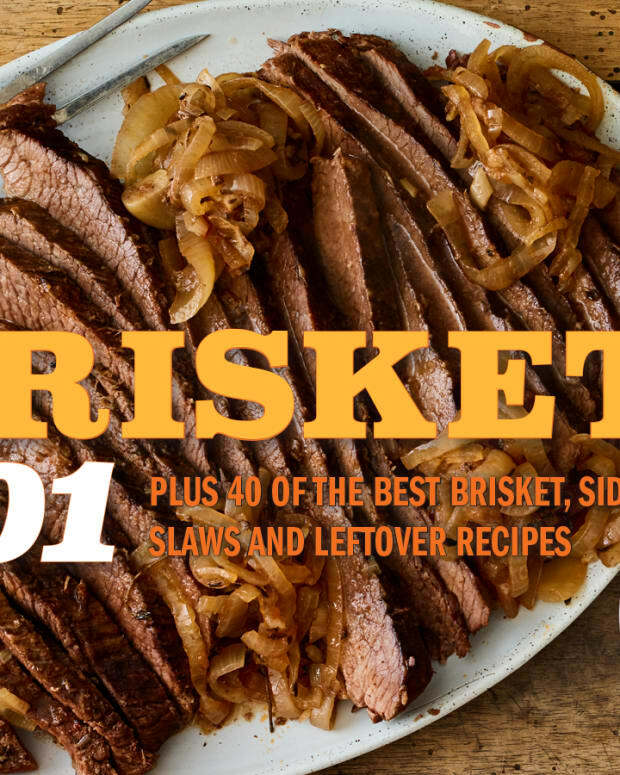 For more tips, tricks, and recipes to make the best brisket ever, get my Brisket 101 Book.